Jumping around the web, I see lots of great information. None of which you will see here ! Summer of 2012 will be long remembered as one of the nations hottest. BBQ season has suffered a little but I'd rather flip burgers and ribs on a hot grill than heat the kitchen up baking or frying what ever we had ready to cook. "Das Boot" is coming along well and I'll be transfering it to the new trailer shortly. I need to do that to get the motor off the ground and test it in a big can. Not running down the river for a while since the only boats not hitting bottom are kayaks and canoes. the boat is no longer for sale, at least not at $900. I stopped adding up my costs at $1,800 - YIKES ! Check out the BBQ sauce section. I just finished a batch in June, and will be working on another one soon. Thank you for visiting. 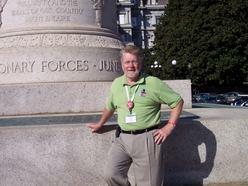 This is at the First Division Memorial in D.C.
2012 flights to DC are: August 22, September 12, October 3 and October 23. Check out the Honor Flight web site for great photos and flight reactions from our Greatest Generation of heroes.